Some links in this post are affiliate links, which means I earn a small commission at no extra cost to you! Thank you for supporting Whistle and Ivy! This week is Etsy’s 13th birthday! 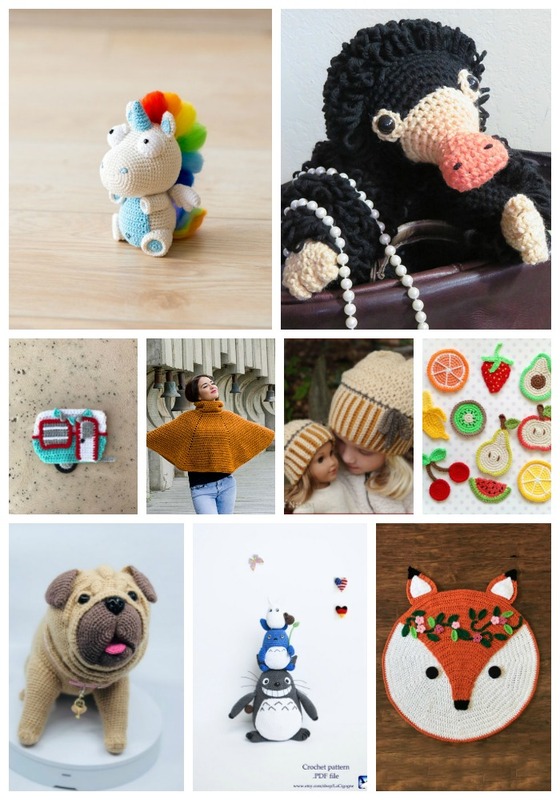 If you are new to Etsy, it’s an online marketplace for handmade and vintage items. 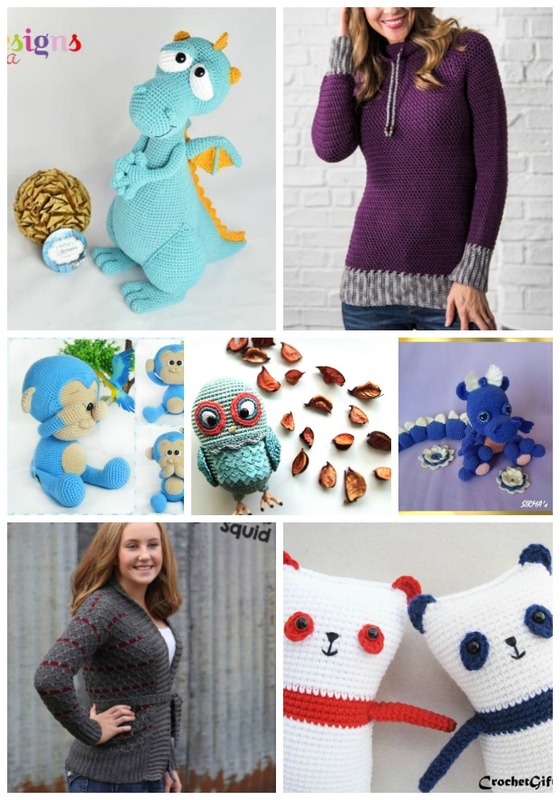 If you are not new, then you know its home to thousands of indie crochet pattern shops! There are so many shops that I adore. 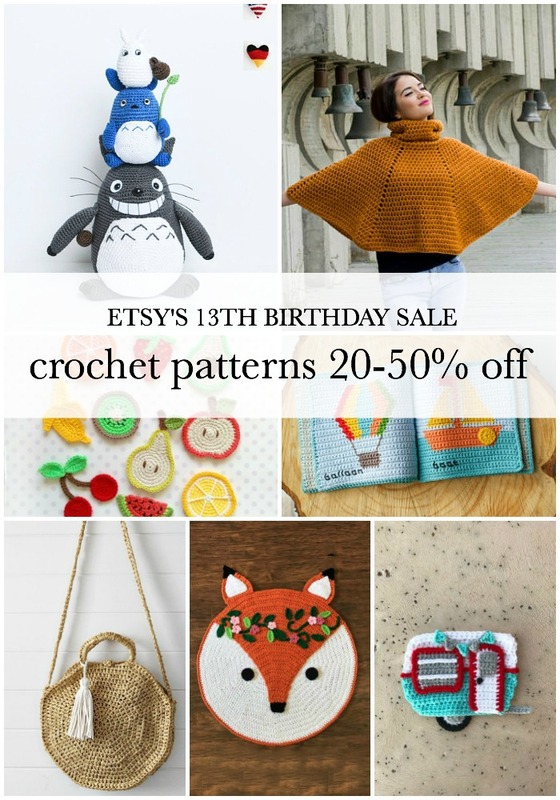 As I scoured through the thousands of crochet patterns that have been discounted for Etsy’s 13th birthday sales event, I decided to put my favorites in a list and share with you. I hope you find something here that you love! I decided to organize the patterns into percentages, starting with 20% and going up to 50%. 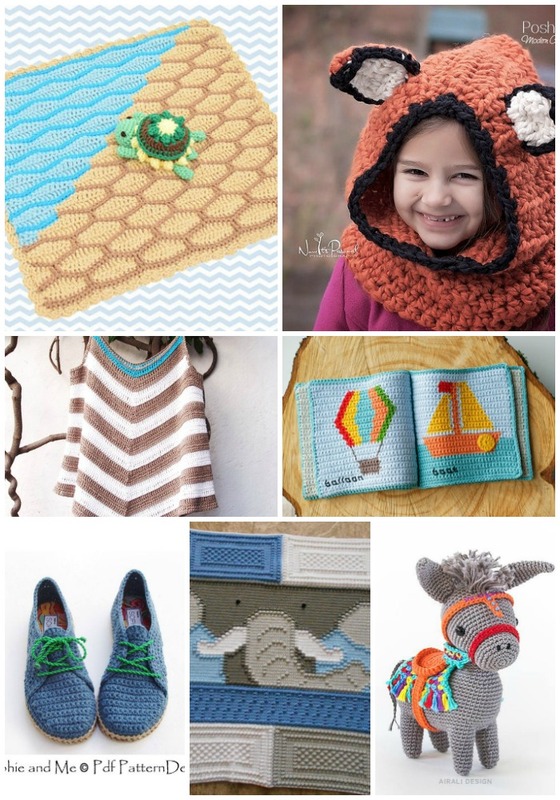 Browse through my favorites, you can you browse through over 25o pages of sale patterns here. 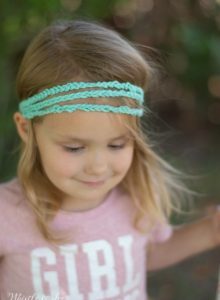 My mind has been bubbling with ideas since I first tried out Bernat’s new Outdoor Yarn. Have you tried it yet? 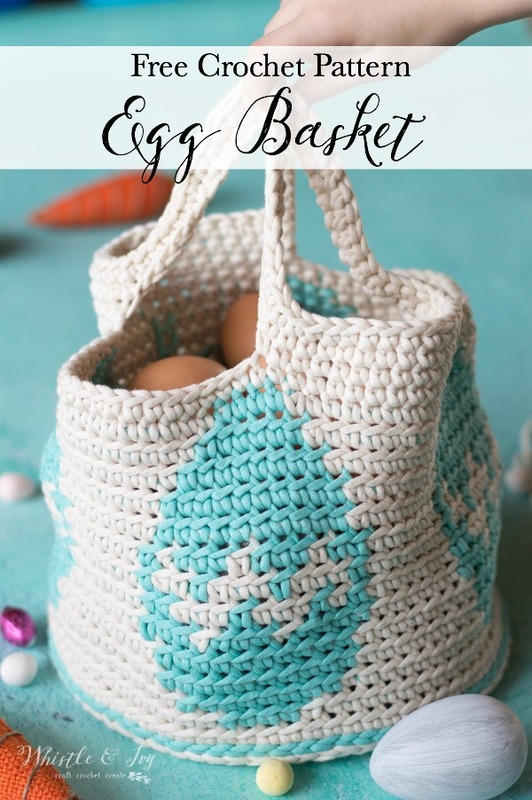 I designed the free crochet pattern for this adorable Bike Basket Bunting last week and have been cruising around in style. 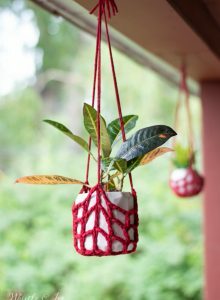 This week I got my yarn out again and made a cute and FAST crochet plant hanger for my porch (well, a few actually!). These ones are made are for smaller plants, so I am excited to make a few more to hold larger planters. 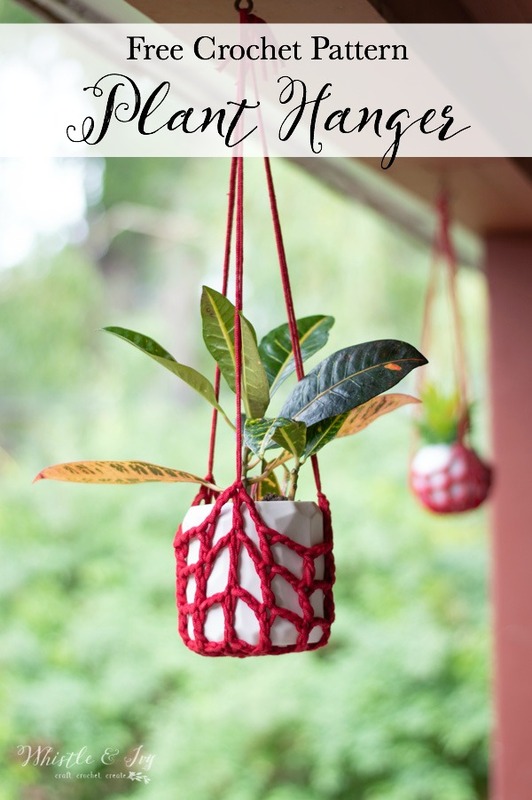 This free crochet pattern is easy customizable for any size planter you want to hang. 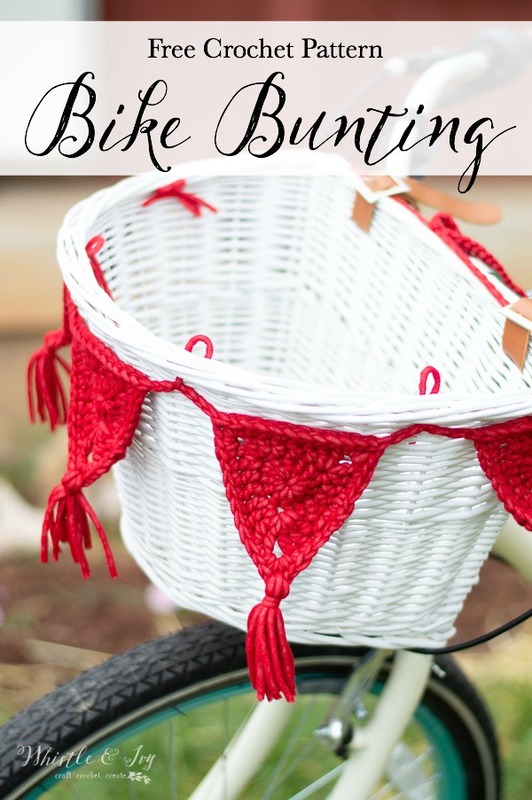 This Crochet Bike Basket Bunting post contains affiliate links, which means I get a small commission if you make a purchase, at no extra cost to you. I also received this Bernat Outdoor yarn free of charge, but am not receiving additional compensation for this post. Thanks for your support! 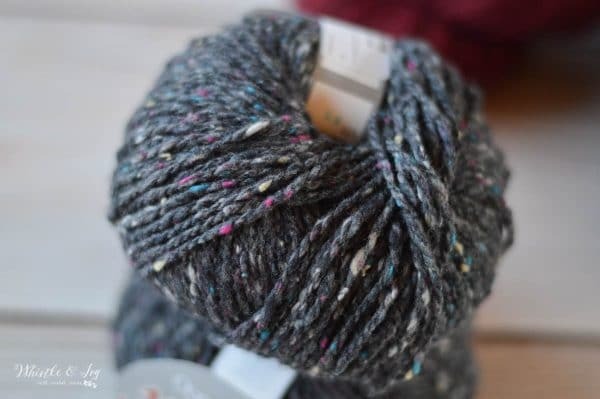 Okay guys, let me drop a game changer on you: outdoor yarn. 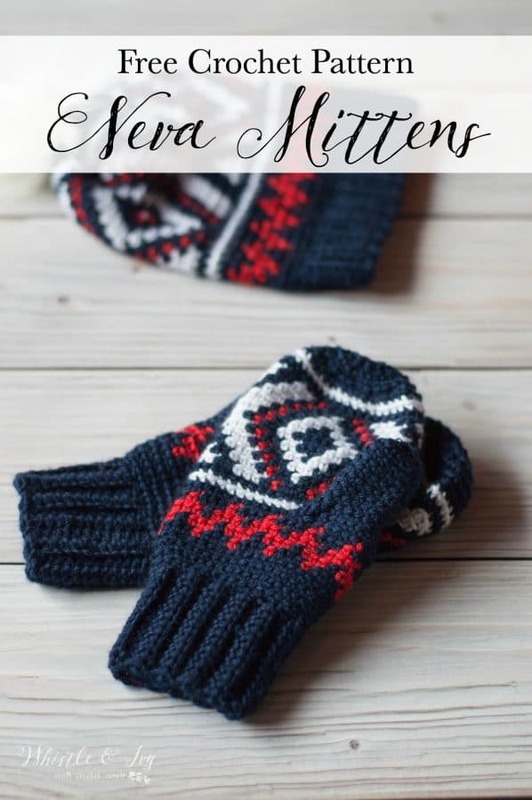 About two weeks ago Bernat let me in on a little secret and sent me a few balls of their NEW outdoor yarn, Bernat Maker Outdoor. It’s mold resistant and won’t fade in the sun. How cool is this?! I immediately got going on a project that, unfortunately, ended in total failure. 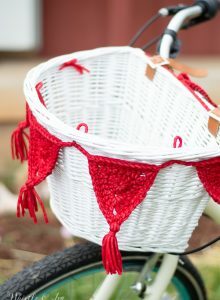 However, I got a new, cuter idea to make crochet bike basket bunting and it turned out so adorable! I’ll admit something weird: I don’t like pepperoni pizza. I guess I am crazy or something, because everyone seems to love it except me (and both my kids, who are apparently as strange as I am). Even as a kid I would peel off the pepperonis whenever we ate pizza, turning it into a delicious cheese pizza. I am a total cheese pizza girl all the way. However, cheese pizza is kinda boring, don’t you think? 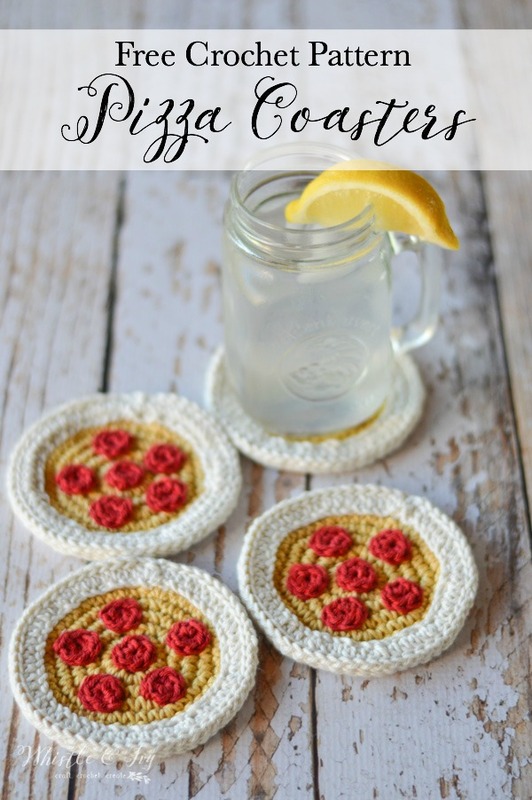 When I decided to make some crochet pizza coasters, I decided FOR pepperoni. 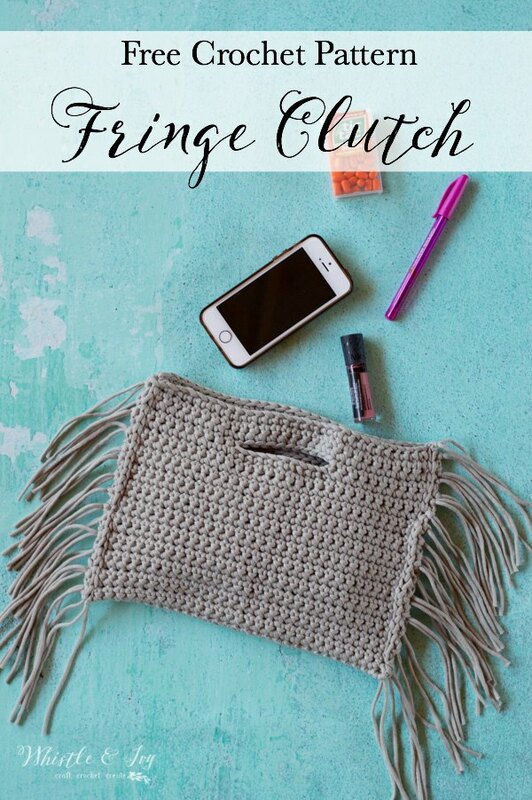 This crochet fringe clutch is a makeover pattern! 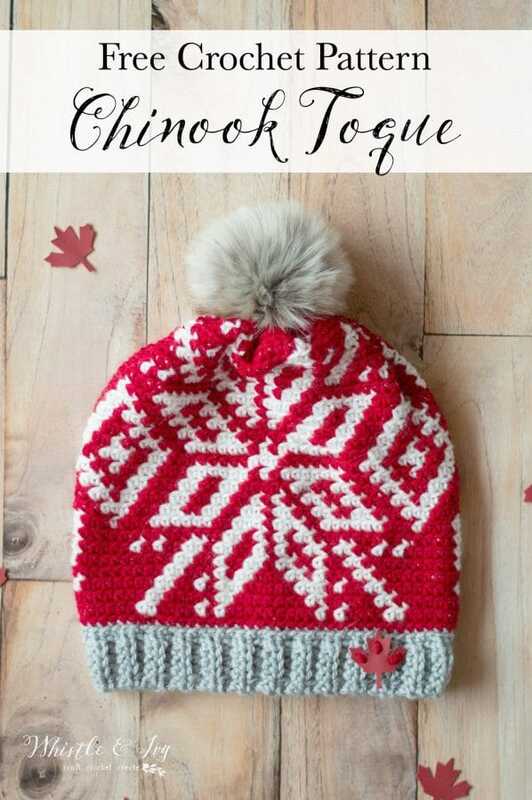 I designed this crochet pattern in thick acrylic/wool yarn last summer. 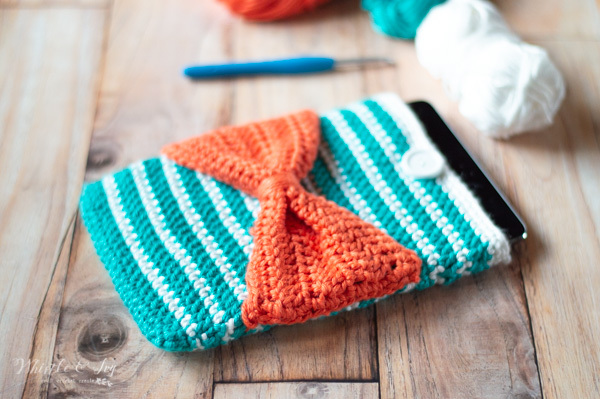 I actually really like it in the bulky yarn, and it works up so fast, but I really wanted to make it in t-shirt yarn. 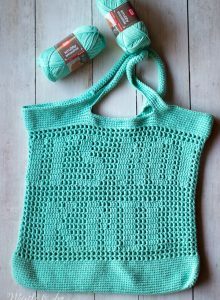 I had searched but hadn’t found an affordable, readily available t-shirt yarn, so I settled for a bulky acrylic. However, a few weeks ago I discovered Bernat Home! 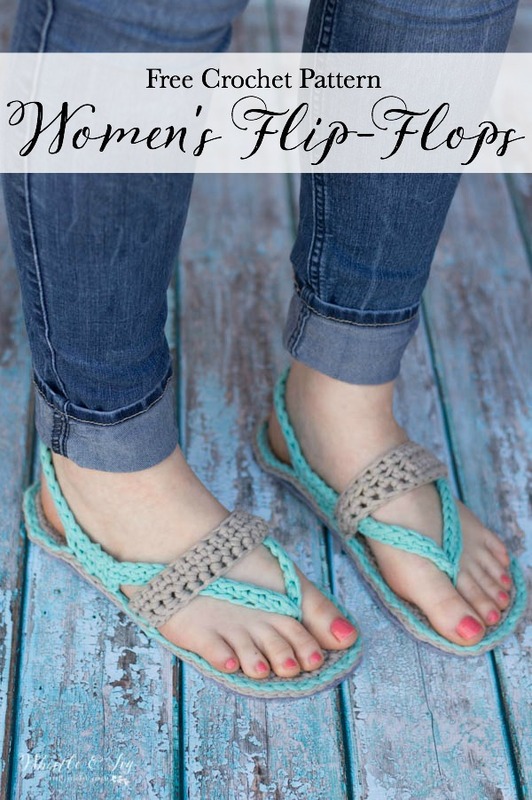 I am currently working a few projects with it, and I made these deliciously comfortable flip-flops sandals last month. 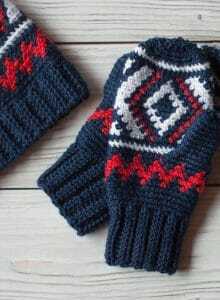 The stretchy texture is perfect for slippers. It’s SO comfortable. And of course I decided to remake my crochet fringe clutch with this newfound yarn. Star Wars is one of my geeky fandoms (I am a HUGE Potterhead, too). For some reason, I forget about Star Wars Day (May the 4th) until it’s practically upon me. 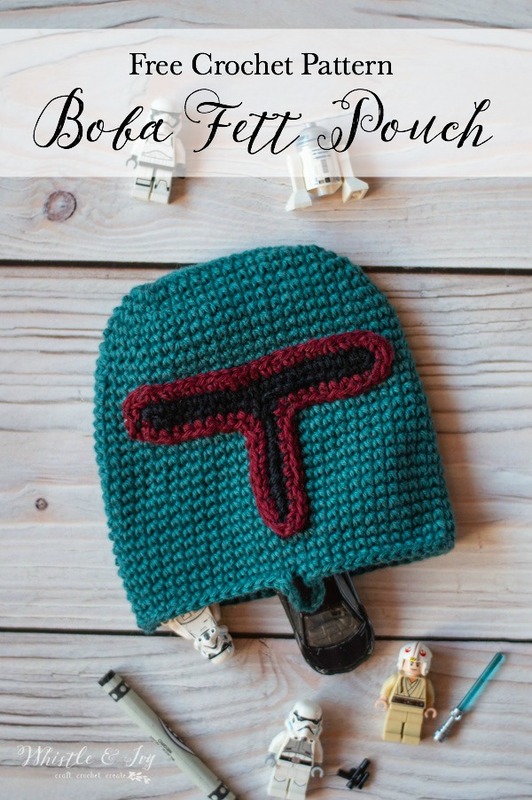 I had the idea for this crochet Boba Fett pouch last year, but I didn’t think far enough ahead to finish it. 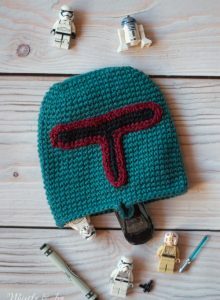 Luckily, I got to it this year, but I have a Star Wars Crochet WEEK on my calendar for next year, so hopefully May 4th, 2019 will be a bit more exciting! Do you have a black thumb? 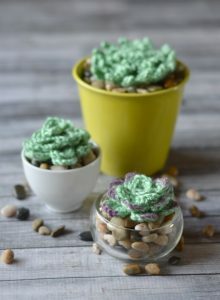 Then these darling crochet succulents are perfect for you! Make them in two styles and fill your home with cute, handmade greenery. 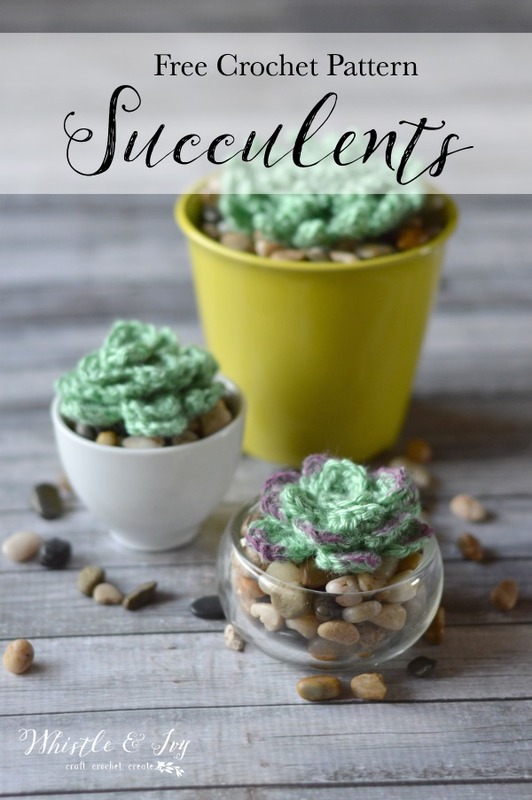 The free crochet pattern for these crochet succulents includes a small round succulent and a larger spikey succulent. 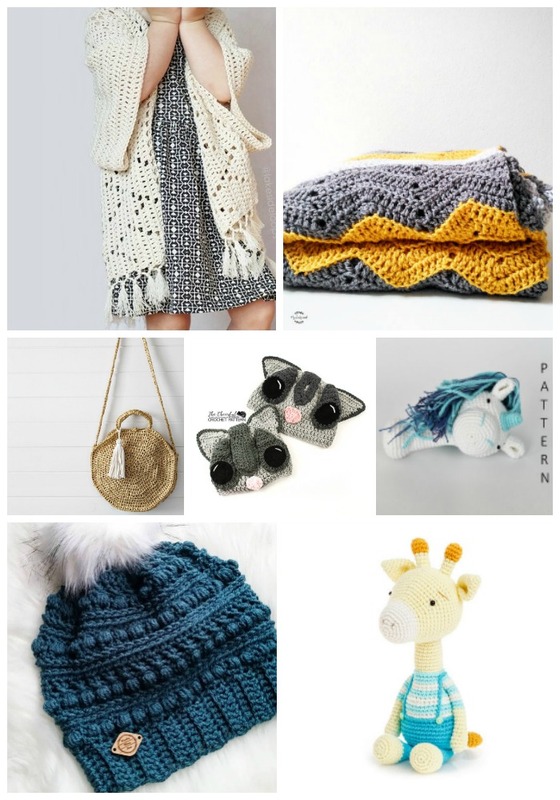 They make perfect gifts as well! This post contains affiliate links which means I get a small commission at no extra cost to you. Thanks for your support! 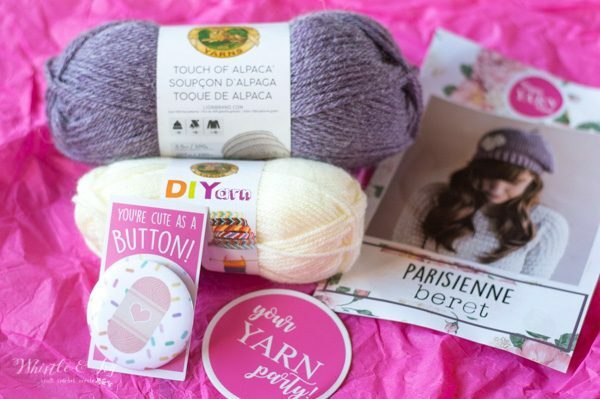 I am sure you have heard of the various kinds of monthly subscription boxes, but have you heard of this delightful crochet subscription, Happy Yarn Mail ? My March project came this week and I was excited to open it up see what surprises await. 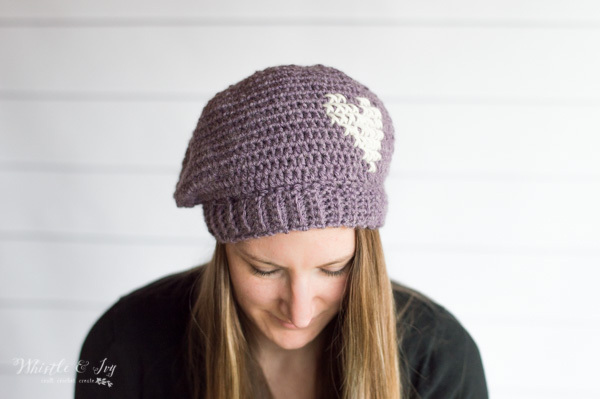 Inside the March box is materials and instruction to make this pretty crochet beret, the Parisienne Beret, complete with an adorable cross-stitch heart. 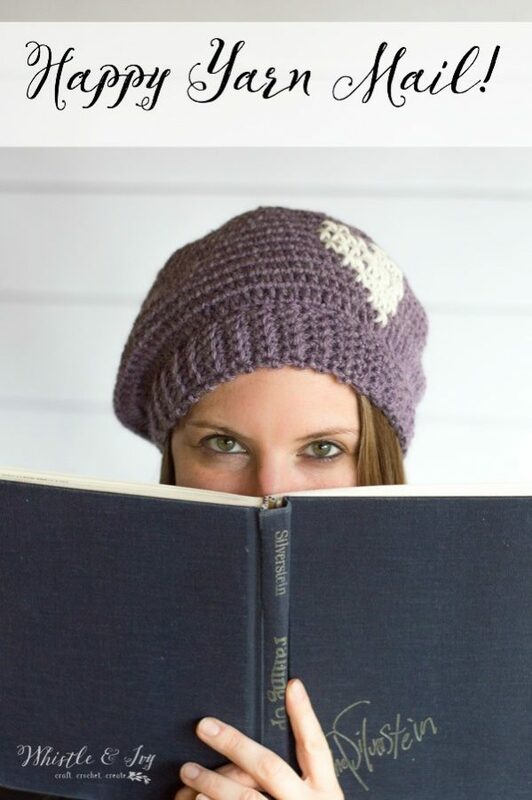 I am more of a slouchy girl myself, but this beret turned out darn cute. 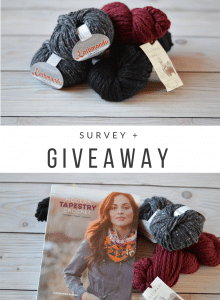 What is Happy Yarn Mail ? 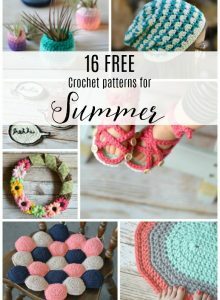 It’s a lovely, crochet subscription that comes monthly in the mail! 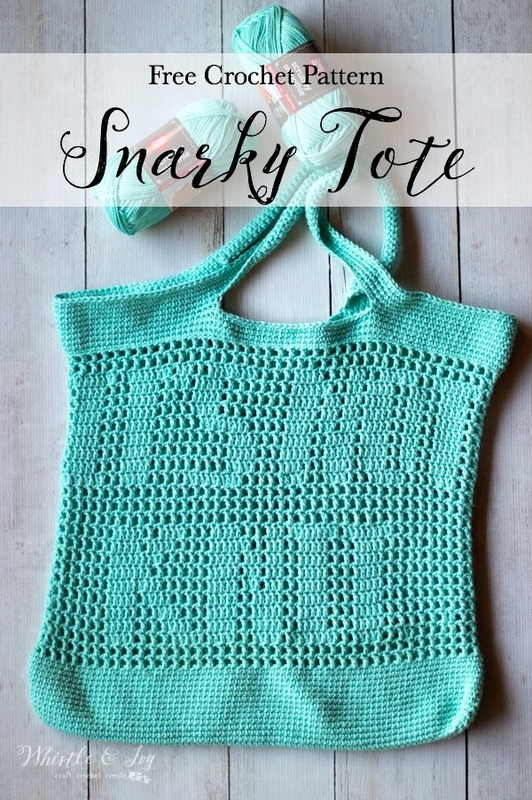 Inside the cute sprinkled bag you will find a simple and easy-to-read pattern, all the yarn needed to compete the project, and some other bonus goodies. How adorable is that button? 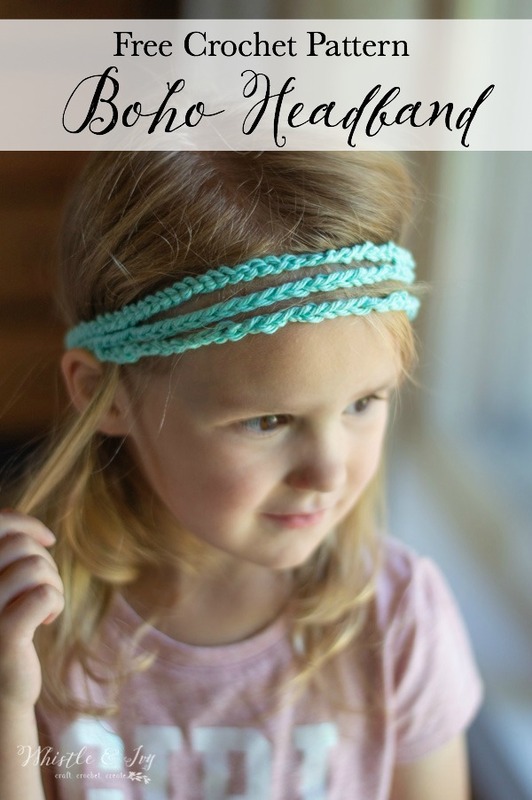 Plus, the pattern comes with a video. 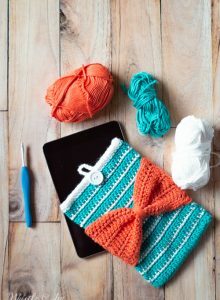 You can be sure that any pattern that comes in Happy Yarn Mail with be something you can complete. 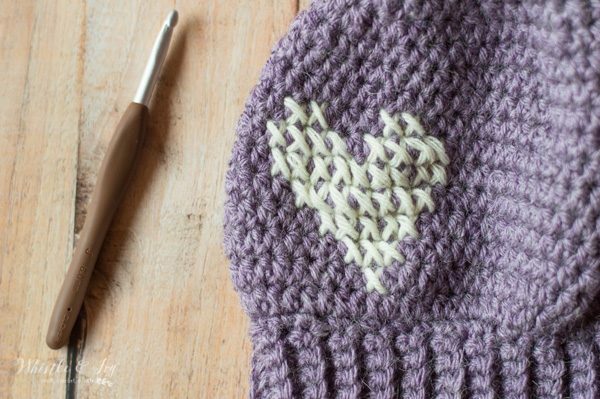 Simply follow the URL on the back of the pattern booklet and enter the password provided. 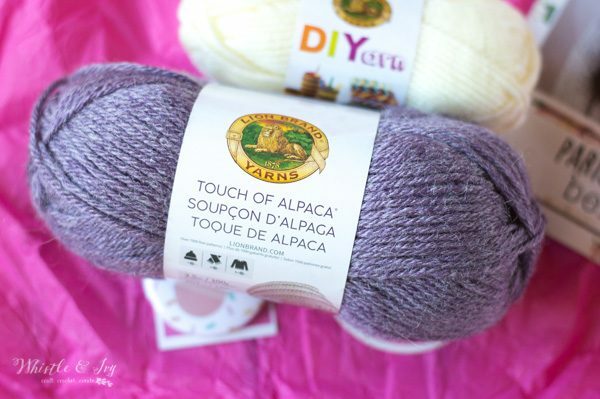 March’s project came with this squishy Touch of Alpaca by Lion Brand Yarns. I haven’t tried this yarn before getting my Happy Yarn Mail. 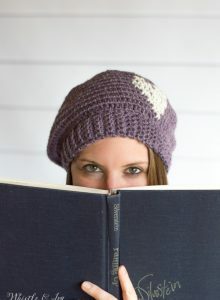 Quite frankly, I have never made a crochet beret before either. This box is fun because it provides an opportunity to try something new, something you may not choose for yourself but something you will end up loving! Turned out quite cute, don’t you think? You can see that my hand-sewing skills are quite lacking. 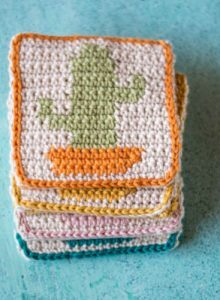 My mom is an avid cross-stitcher, and the one thing I remember learning from her is to work the top crosses of each stitch all the same way. At least I’ve got that going for me! 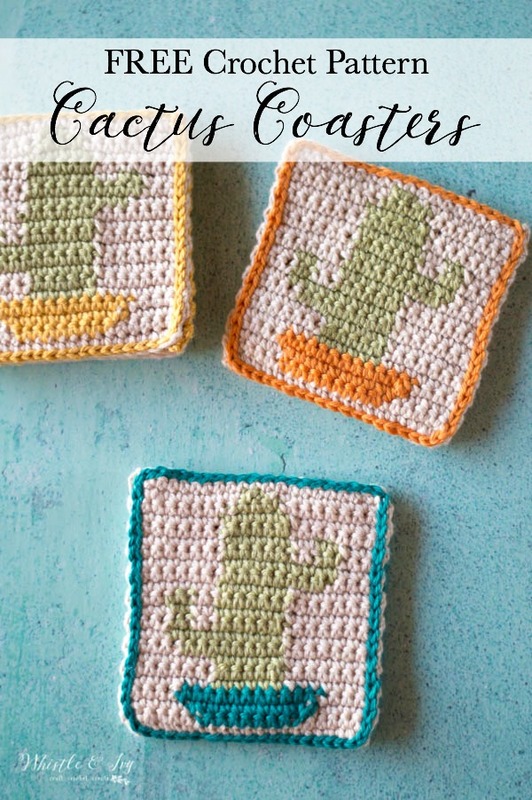 Okay, so if you are reading to start your monthly crochet subscription, hippity-hoppity over to Happy Yarn Mail and snag up your April box, because they sell out FAST! Once, they’re gone, they’re gone. 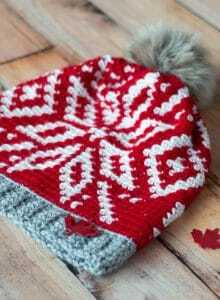 This post includes affiliate links, which means I earn a small commission if you make a purchase, at no extra costs to you. Thanks for supporting Whistle and Ivy! 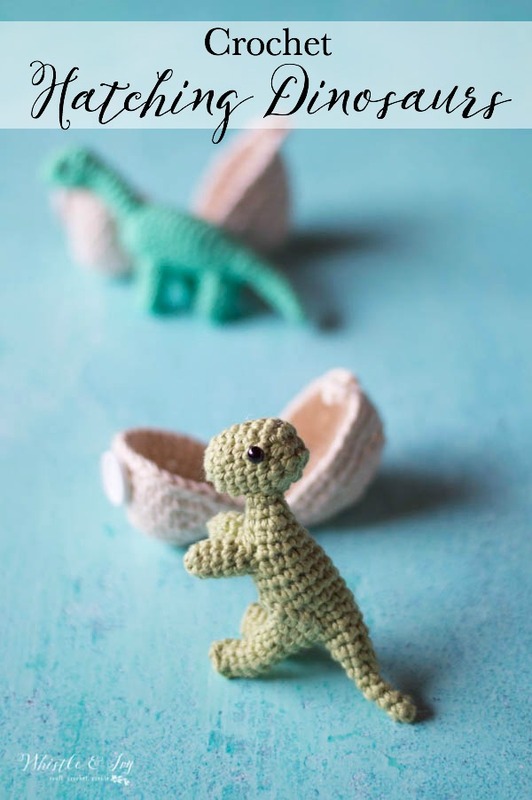 I have been swooning over these crochet hatching dinosaurs for a while now. I saw them on Facebook last year and they have been on my to-do list ever since. 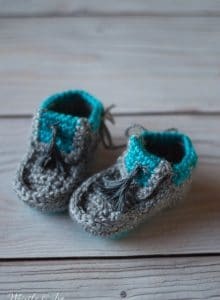 I am finally get around to making them for my kids, and I thought Easter was the perfect time. I was going to put them in their baskets, but who am I kidding? 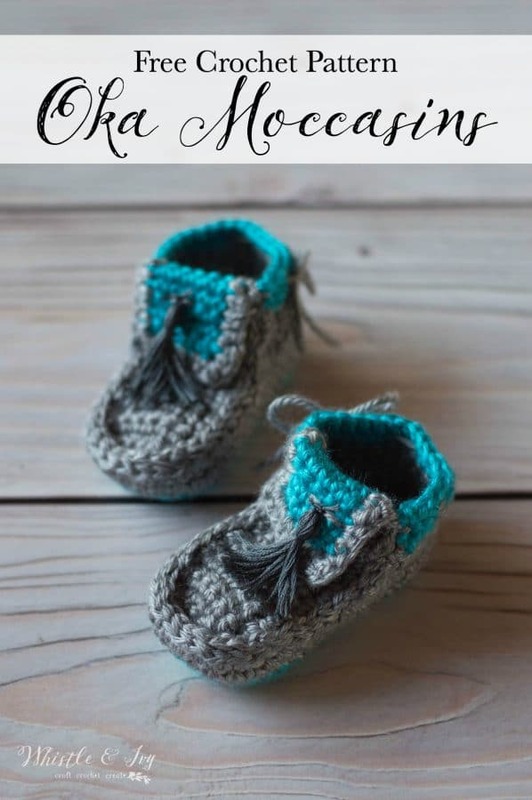 I crochet throughout the day, and they were bound to be curious about what I was making. 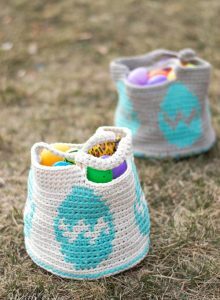 I also avoided any awkward questions about how the Easter Bunny can or can’t crochet exactly like Mommy. 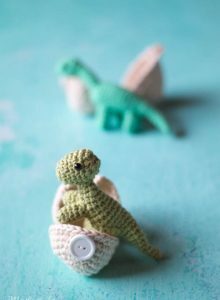 Plus, they have been playing happily together for the last 2 hours with their new baby dinosaurs! It’s pretty darn cute. 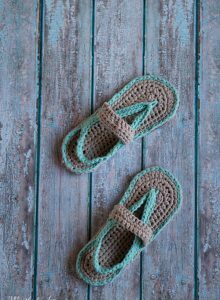 Do you lose your crojo (crochet mojo) a bit in the summer? I admit I do a bit. Summertime is my jam! I want to be outside, playing in the sun, digging in my garden, repainting furniture, sipping drinks and a million other things. When evening comes, I am not super interested in sitting under my large WIP crochet blanket. I have a feeling there are a few of you who are with me. But don’t worry, I got you! 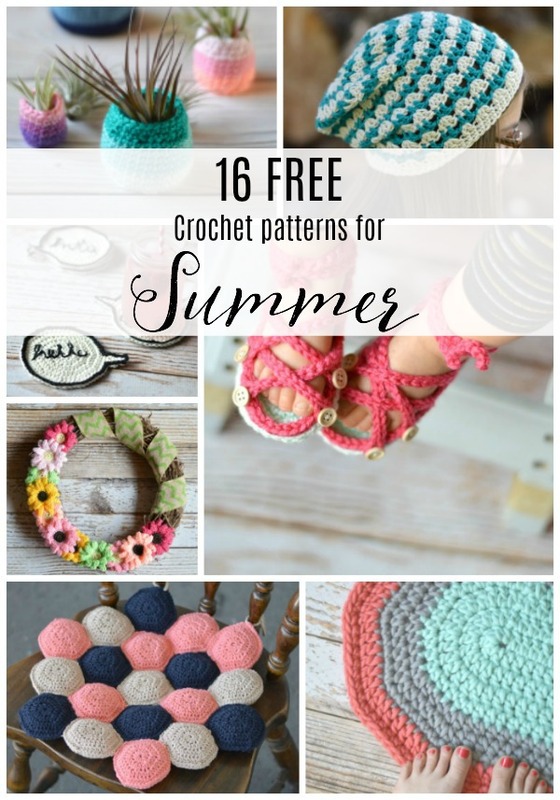 In this post are 16 fun summer crochet projects that are perfect for your summer crochet bucket list. Which one are you going to try first? When I started my blog about 6 years ago, it was a bit of a potpourri. 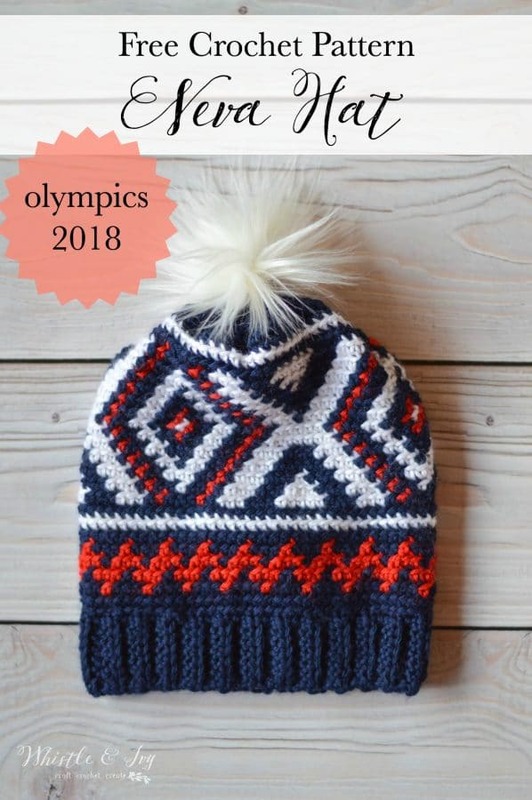 I blogged about a lot of things; things I thought were AWESOME and that everyone should read, but in reality, were not (take a look at my archives if you don’t believe me, but be forewarned, it gets pretty scary back there). 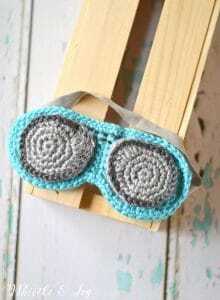 One project that I made that was really “useful” was this Felt Aviator Sleep Mask. My son had basically wrecked my sleep schedule by never sleeping ever until he was about 8 months old. I had a really hard time resting, even when I was getting a few straight hours of sleep. I found a sleep mask helped me quite a bit. I don’t need it nightly anymore, thankfully, but it still comes in handy occasionally. 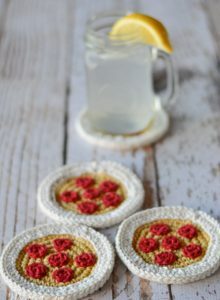 Since my blog isn’t so much a potpourri as it is a yarn and crochet blog, I decided it was time for a crochet make-over. 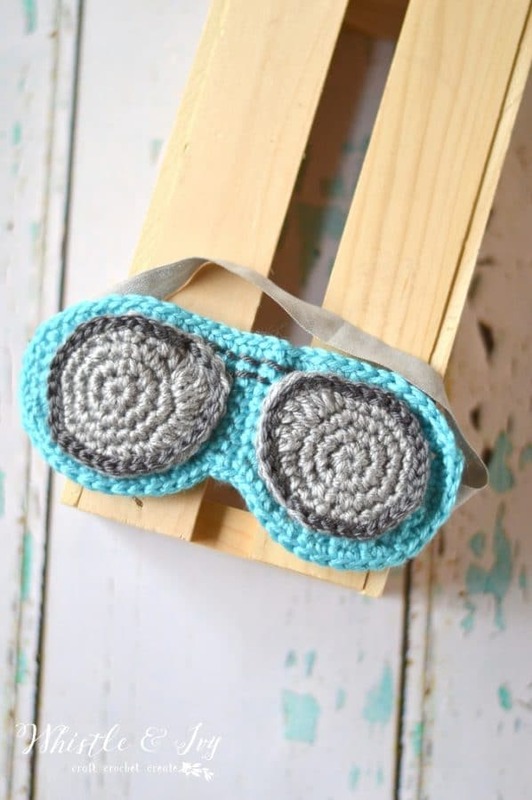 So today I am sharing the pattern for this crochet aviator sleep mask pattern! I have spend a lot of time reflecting on my goals for this coming year. I have a few doozies, but I honestly feel like if you set the bar higher than you think is possible, you can surprise yourself what what you can achieve. One of my main goals is to be a resource for you. 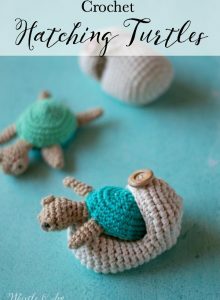 A place where you can find all the cute crochet goodness, awesome hacks and helpful reviews that you could want or need. To make sure I am on the right track, I was hoping you could help me by filling out this quick survey. 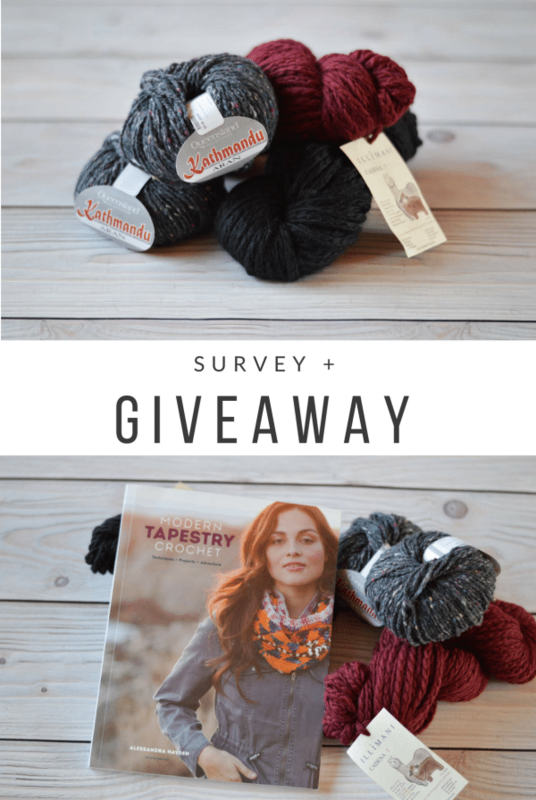 As an extra incentive, I am hosting a giveaway in exchange for your help! 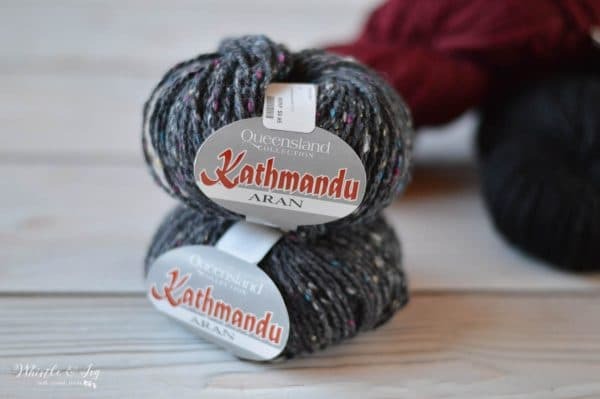 I found this beautiful yarn in a cute little shop in Orlando when we visited there for our 10th anniversary. I make it a point to find little yarn shops when we travel, it’s so much fun! The beautiful store we visited is called the Knitting Patch and is owned by a sweet Russian woman. It is a fantastic place, and I had a hard time choosing only a few skeins. 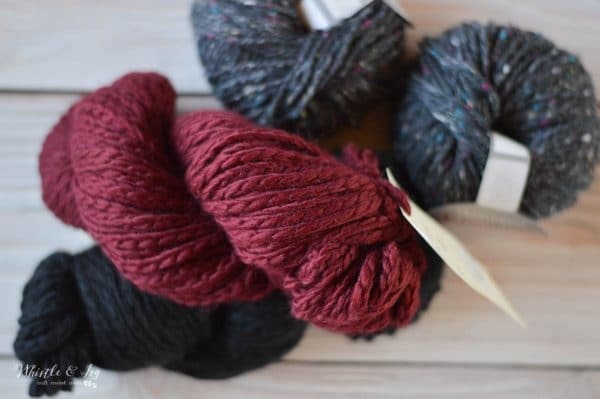 I settled on two skeins of beautiful wool tweed, and two hanks of super soft baby alpaca yarn in burgundy and black. 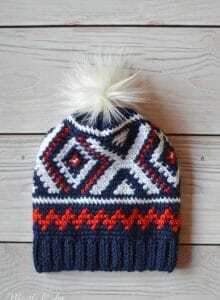 The alpaca yarn is so soft. SO SOFT YOU GUYS. 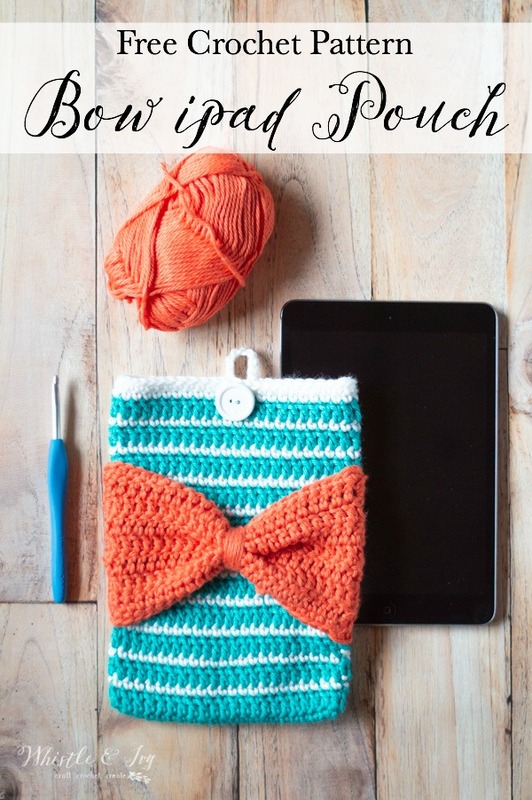 I am also including a copy of Modern Tapestry Crochet, by Alessandra Hayden, the book that gave me courage to try tapestry crochet! I also have a few other freebie entries for those who want their hat in the ring a few extra times. Thank you so much for your help! I hope that together we can make 2018 AWESOME!